Halloween season has always been one of my favorites times as a kid. I loved all of the festivities from getting creative and dressing up to the candy and the fun of trick-or-treating. 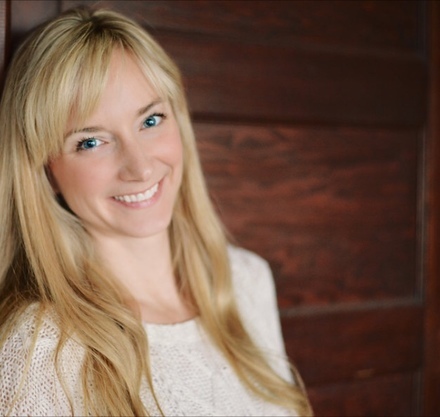 I am excited to create those fun memories with my kids now! 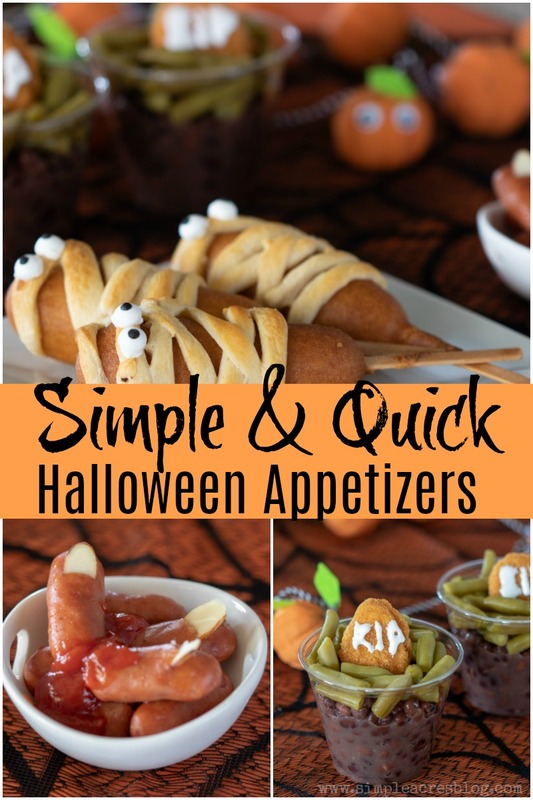 One way to add fun to this season is with simple and quick Halloween appetizers perfect for entertaining or just for fun! I never have liked the spooky part of Halloween but I definitely love the cutesy part! The cute jack-o’-lanterns, the fun food, costumes,time spent with loved ones just enjoying quality time together. I’ve been wanting to make some fun recipes for my kids for a long time. 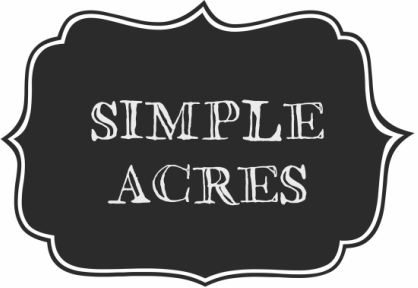 I recently experimented with a few ideas that became my simple and easy Halloween appetizer menu I will be making for my kids! 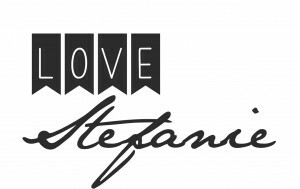 I thought you may love them too as they include products you may already have in your kitchen. 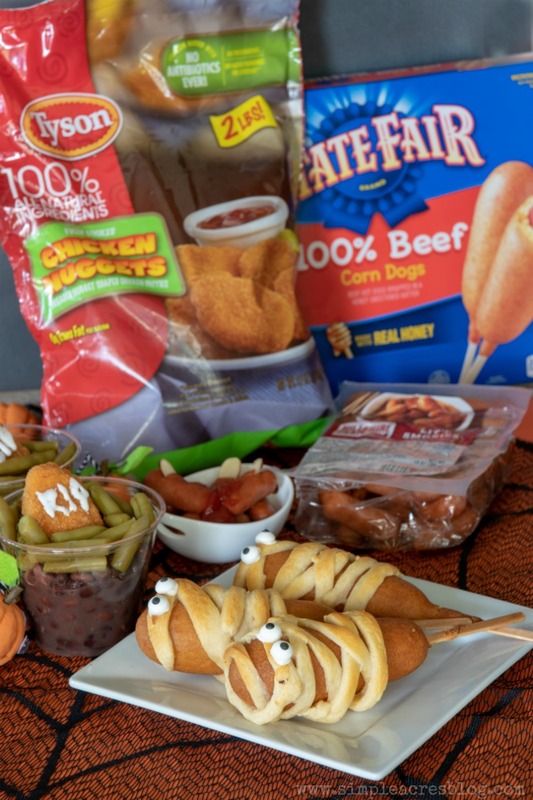 I got the honor to collaborate with State Fair® Corn Dogs , Tyson® Chicken Nuggets and Hillshire Farm® Lit’l Smokies products and I am excited to show you a few simple Halloween recipe inspirations using their products! We enjoyed our trip to Walmart where we found all that we needed in the center refrigerator section near the meat department and in the meat department itself. Just bake your corndogs at 350 degrees for 10 minutes then remove from the oven. 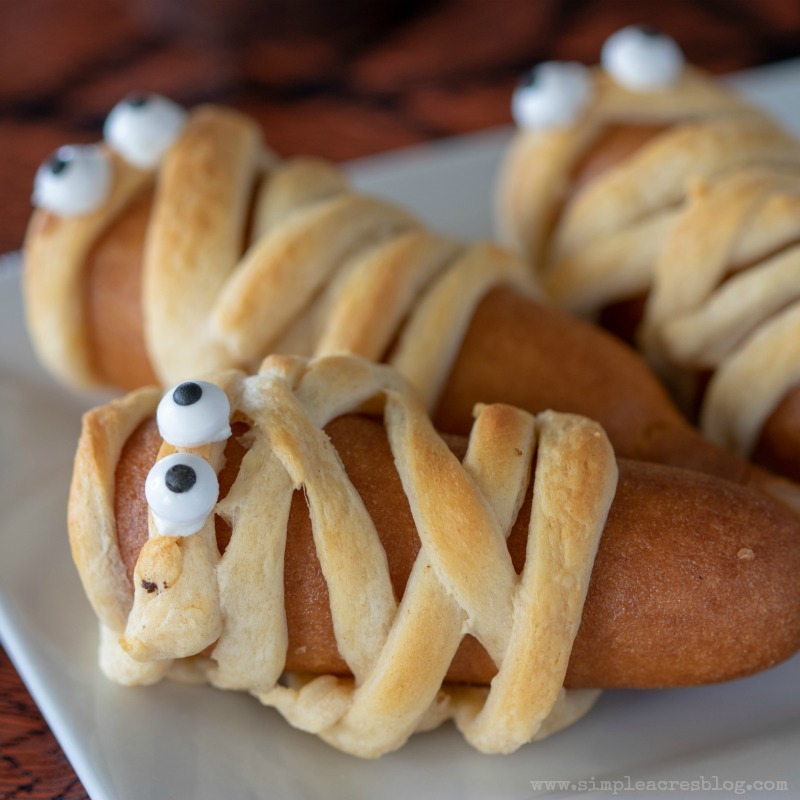 Place strips of croissant product around your corndogs to create a mummy look. Bake fro 8-10 more minutes. You can use small dots of sour cream to attach sugar eyeballs onto your mummies. Enjoy with ketchup and mustard. 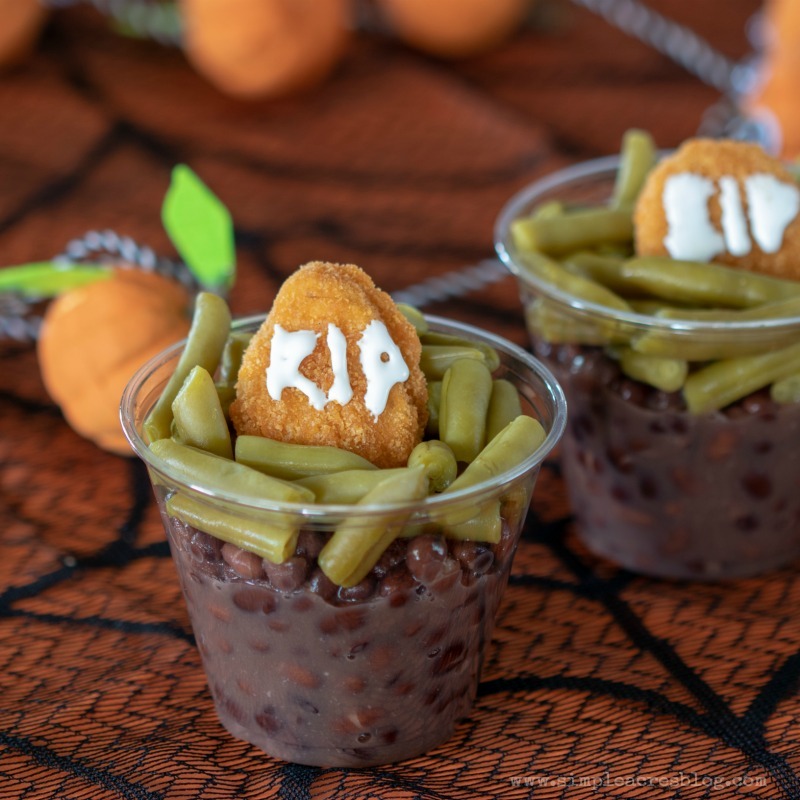 For this recipe, you use chicken nuggets, black beans and green beans to make a fun graveyard. You do this by layering everything in a clear plastic cups with black beans as the “dirt”, green beans for the “grass” and the baked chicken nuggets as “tombstones”. Just warm your varied beans and bake your chicken nuggets per package. You can use sour cream piping to write RIP on your chicken nuggets and place them in your cup just like a tombstone in a cemetery. For this recipe you use Hillshire Farm® Lit’l Smokies . You can cook them up however you would like whether you microwave them, cook them in a slow cooker in some sauce or bake them. Once they are cooked, you make a little cut with a knife at the front end of your little smoky and slide a slivered almond inside. This gives the appearance that creates your little witch fingers. 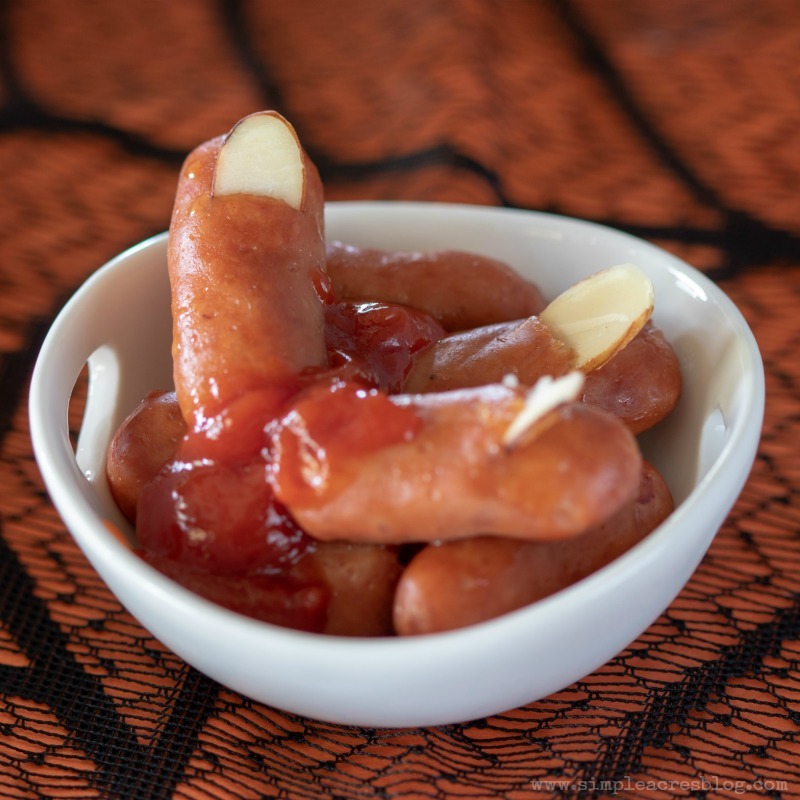 Squeeze some ketchup on them and that adds a little bit of a spooky touch to an easy appetizer dish. These simple and quick Halloween appetizers can be used on Halloween day, when you’re hosting a party or just for fun.